This is my favorite dessert to bring to a barbecue or any occasion that falls during summer due to the abundance of sweet fruit during the season. 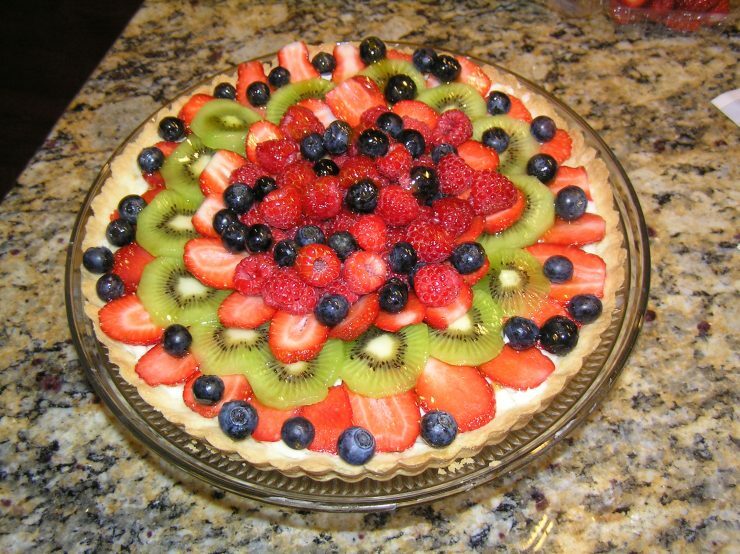 Fancy fruit tarts like this one sell for around $20 in the supermarket or bakery. It is as pleasing to the eye as it is your taste buds. Don’t be intimidated – anyone can make this yummy dessert. For the crust: In a food processor, combine the confectioners' sugar, flour, and butter, and process until the mixture forms a ball. Bake for to 12 minutes, until very lightly browned. Set aside to cool. For the filling and topping: Beat the cream cheese, sugar, and vanilla together until smooth. Spread over the cooled crust. Cut the strawberries into ¼-inch slices and arrange around the edge of the crust. For the next circle, use kiwi slices. 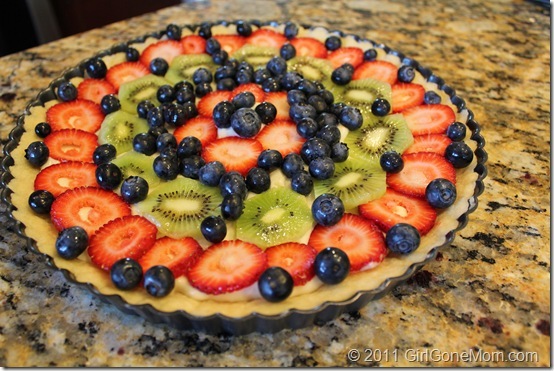 Add another circle of strawberries, filling in any spaces with blueberries. Cluster the raspberries in the center of the tart. Glazing: Microwave a mixture of ¼ cup apricot preserves with a few tablespoons water. Brush it over the fruit carefully to give it shine. Be creative – use what fruits you have and play with different designs. I have never made a fruit tart before, but I love how easy you make it look. This just screams summer to me :) PINNED!